My obsession with Humpty Dumpty is both visual philosophical in nature. 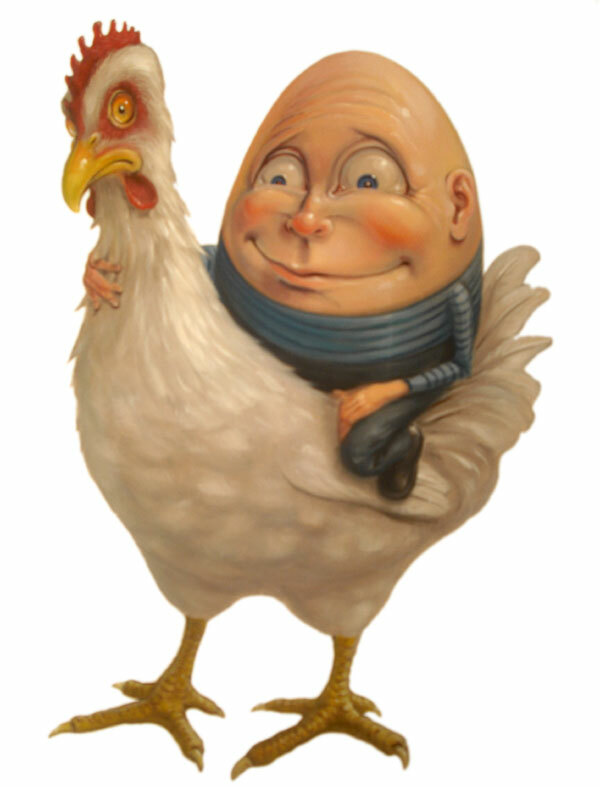 I am drawn to the famous egg visually, through his numerous portrayals in children’s books. His ovoid shape and cephalic body create a disconcerting strangeness that is hard to forget. Often styled with an equally strange grimace his impact on impressionable children is assured. One of the more famous portrayals is that by John Tenniel in Lewis Carrol’s Through the Looking-Glass (1872). Tenniel’s version of Humpty Dumpty with his wide slit mouth and creepy arched brows has stuck with me and penetrated many of my own characters in my paintings. Aside from being physically creepy Humpty is also an egg. Frail, vulnerable and awkward he becomes a perfect symbol for the existential human. 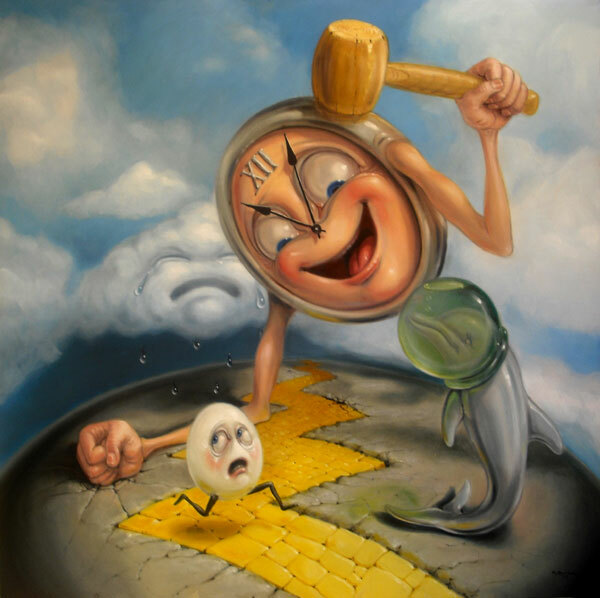 We are in constant state of alert when it comes to self-preservation and safety, something Humpty took too lightly. 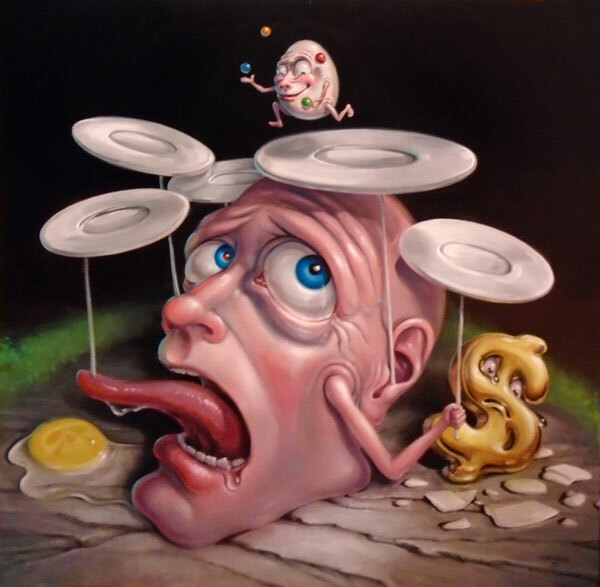 I often insert Humpty into my paintings as a symbolic representation of myself. Sometime he is just included as a frail human witness participating in my jumbled scenarios. He becomes a sympathetic entity that the viewer can hopefully identify with. * The rhyme does not explicitly state that the subject is an egg, possibly because it may have been originally posed as a riddle. There are also various theories of an original “Humpty Dumpty”. One, advanced by Katherine Elwes Thomas in 1930 and adopted by Robert Ripley, posits that Humpty Dumpty is King Richard III of England, depicted as humpbacked in Tudor histories and particularly in Shakespeare’s play, and who was defeated, despite his armies, at Bosworth Field in 1485. 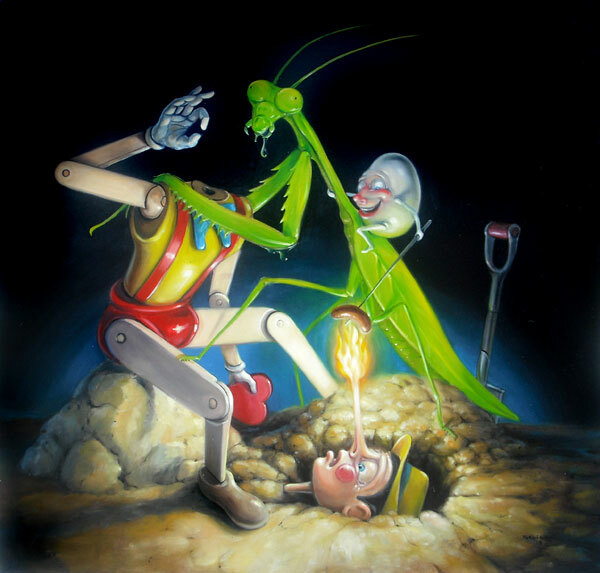 This entry was posted in Canadian Artist, Canadian Surrealism, Humpty Dumpty and tagged art, artist, bubblegum surrealism, canada, canadian, canadian artist, canadian pop surrealism, canadian surrealism, humpty dumpty, stephen gibb, steve gibb, surreal reese cup, surrealism. Bookmark the permalink. Both comments and trackbacks are currently closed.